CLEAN CARFAXED BEST 2005 YELLOW SCION XB RELEASE MODEL IN THE UNITED STATES. AUTO, AC, CD, TACH, PW, PL, SCION MAG WHEELS. CASH OR TRADE ON EL CAMINO OR TOYOTA TRUCK. NO SALVAGE TITLES PLEASE. 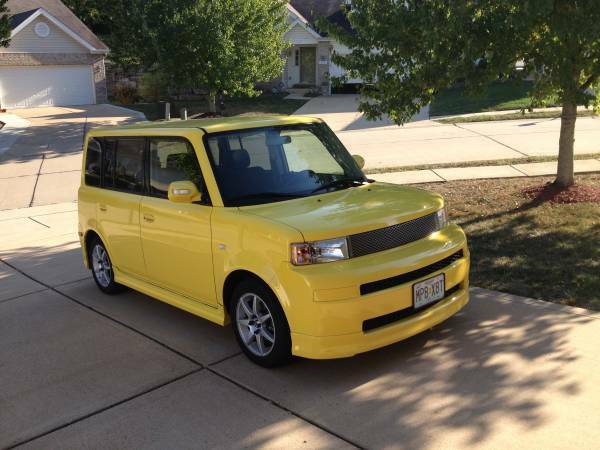 2005 YELLOW SCION XB RELEASE MODEL IN MINT CONDITION WITH ONLY 64233 MILES. THIS IS NUMBER 66 OF 100 YELLOW RELEASE MODELS AND VERY RARE COLLECTOR QUALITY CAR. SENIOR CAR COLLECTOR OWNED, REAR SPOILER, NEW FOG LAMPS IN THE BOX, CHROME GRILL, UPGRADED 2.0 ENGINE INSTEAD OF 1.6, YELLOW AND BLACK BUCKET SEAT INTERIOR WITH THE REAR SEATS FOLDING DOWN FLAT TO CARRY CARGO. ALL SCION SYSTEMS ARE MADE BY TOYOTA AND I RECENTLY DROVE THIS SCION FROM MY GARAGE IN ST. LOUIS TO MY GARAGE IN PHARR TEXAS AND WAS A COMPLETELY STRESS FREE DRIVE GETTING 33 MILES PER GALLON. THE INTERIOR IN THIS YELLOW XB IS FLAWLESS AND THE BLACK BUCKET SEATS HAVE YELLOW SEWN INTO THE MATERIAL WHICH IS COLOR KEYED TO THE OUTSIDE YELLOW COLOR. THE NEW SCION CHROME MAG WHEELS HAVE BRIGHT BLUE AFTERMARKET LUG NUTS WHICH REALLY SETS OFF THE WHEELS. THE ENGINE COMPARTMENT LOOKS BRAND NEW AND IS WAXED JUST LIKE THE OUTSIDE OF THE CAR. ALL XBS HAVE PW, PL, CD AND COLD AC. NEWER AFTERMARKET EXHAUST INSTALLED TO GIVE CAR NICE SOUND. HAVE BRAND NEW SET OF XB LOWERING SPRINGS IN BOX AS WELL AS THE ORIGINAL WHEELS AND NEW SET OF DARK WINDOW VENTVISOR CHANNEL WIND DEFLECTORS. THE REAR TAILLIGHTS WERE UPGRADED TO CHROME AND HAVE THE ORIGINALS IN THE BOX. THE OUTSIDE MIRRORS ARE UPGRADED TO LED TURN SIGNALS. REVIEW THE PICTURES AND YOU WILL SEE THAT THIS COLLECTOR QUALITY YELLOW XB IS IN VERY RARE CONDITION. GETS LOTS OF LOOKS WHEN I TAKE IT OUT FOR ITS WEEKLY SPIN AROUND THE NEIGHBORHOOD. I WOULD FEEL CONFIDENT TO DRIVE THIS CAR TO CALIFORNIA AND BACK WITH NO ISSUES. LOTS OF XB CARS FOR SALE OUT THERE FOR SALE, BUT NOT LIKE THIS ONE. IF YOU HAVE A COLLECTOR QUALITY EL CAMINO OR NEWER PICKUP TRUCK, CALL ME IF YOU ARE INTERESTED AS THERE ARE TOO MANY EMAIL SCAMMERS OUT THERE T TRYING TO GET A VALID EMAIL ADDRESS TO SELL TO ADVERTISERS. LARRY IN PHARR TEXAS.